​Bus transportation is just one way to practices. Parent/Guardian, are responsible to pick up the rower in a timely manner. ​Rowers are not permitted to drive themselves to away Regattas. ALL Try-Outs will be held at Roy C. Ketcham High School. "ALL Rowers are to report to Weight Room "
When the ice melts on the river around mid-March we move to the boathouse. ALL winter training practices will be held at Roy C. Ketcham High School. "ALL Rowers are to report to Weight Room "
STUDENTS SHOULD BRING SCHOOLWORK FOR THE BUS AND ALSO WHILE WAITING FOR THEIR PRACTICE TO BEGIN TO MAKE BEST USE OF THEIR TIME. WE EXPECT OUR ATHLETES TO MAINTAIN THEIR GRADES. ​This is a special Crew Shuttle bus and NOT your normal bus. DON'T MISS THE BUS. Practice will not be canceled for poor weather conditions, if the water is rough we can run if it is raining rowers can practice on erg machines inside the building. 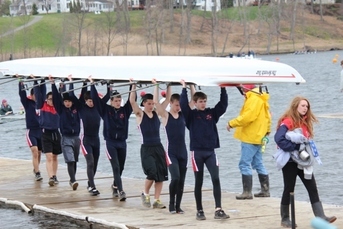 Rowers should wear layered clothing to accommodate for changing the weather. Rowers should also bring extra clothes and a towel to practice in case they get wet. Pick up locations at the high schools are out front of main entrances.......DON'T MISS THE BUS. Pick up locations at the junior highs TBA.